English lawyer, historical and political writer; born at London in 1768; died there July 16, 1845. His grandfather, a Jew of German extraction, was physician in ordinary to Frederick the Great of Prussia, and wrote a French romance, "Histoire des Diables Modernes." 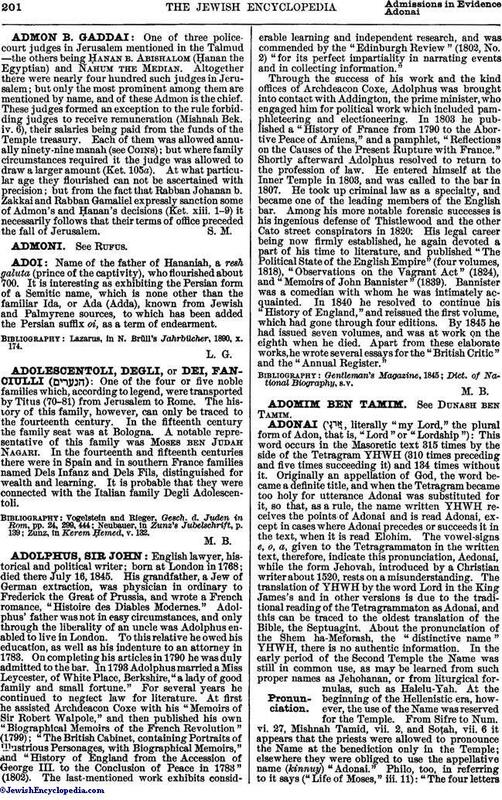 Adolphus' father was not in easy circumstances, and only through the liberality of an uncle was Adolphus enabled to live in London. To this relative he owed his education, as well as his indenture to an attorney in 1783. On completing his articles in 1790 he was duly admitted to the bar. In 1793 Adolphus married a Miss Leycester, of White Place, Berkshire, "a lady of good family and small fortune." For several years he continued to neglect law for literature. At first he assisted Archdeacon Coxe with his "Memoirs of Sir Robert Walpole," and then published his own "Biographical Memoirs of the French Revolution" (1799); "The British Cabinet, containing Portraits of Illustrious Personages, with Biographical Memoirs," and "History of England from the Accession of George III. to the Conclusion of Peace in 1783" (1802). The last-mentioned work exhibits considerable learning and independent research, and was commended by the "Edinburgh Review" (1802, No. 2) "for its perfect impartiality in narrating events and in collecting information." Through the success of his work and the kind offices of Archdeacon Coxe, Adolphus was brought into contact with Addington, the prime minister, who engaged him for political work which included pamphleteering and electioneering. In 1803 he published a "History of France from 1790 to the Abortive Peace of Amiens," and a pamphlet, "Reflections on the Causes of the Present Rupture with France." Shortly afterward Adolphus resolved to return to the profession of law. He entered himself at the Inner Temple in 1803, and was called to the bar in 1807. He took up criminal law as a specialty, and became one of the leading members of the English bar. Among his more notable forensic successes is his ingenious defense of Thistlewood and the other Cato street conspirators in 1820. His legal career being now firmly established, he again devoted a part of his time to literature, and published "The Political State of the English Empire" (four volumes, 1818), "Observations on the Vagrant Act" (1824), and "Memoirs of John Bannister" (1839). Bannister was a comedian with whom he was intimately acquainted. In 1840 he resolved to continue his "History of England," and reissued the first volume, which had gone through four editions. By 1845 he had issued seven volumes, and was at work on the eighth when he died. Apart from these elaborate works, he wrote several essays for the "British Critic" and the "Annual Register."